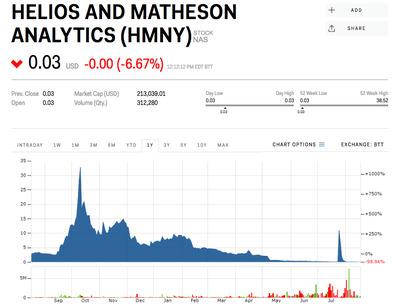 MoviePass owner Helios & Matheson‘s stock has declined by 99.99% since it first acquired the movie service last year. As the stock was falling, investors on Robinhood were snapping up shares. The stock is now worth $US0.03 and Robinhood has barred anyone from buying more shares. As shares of Helios & Matheson – the parent company of MoviePass – plunged to near zero this summer, investors on the free trading-app Robinhood kept piling into the stock. Facing a crunch for cash in July, with its share price already below $US1 and risking being delisted from the Nasdaq stock exchange, HMNY pulled a Hail Mary move. With approval from shareholders at a specially called meeting, management executed a reverse stock split, giving investors one share for every 250 they had previously owned. At the time of the reverse split, about 23,000 investors held the stock on Robinhood, weekly data compiled by Business Insider shows. But shares started crashing before markets could even open on the day of the split. That didn’t phase investors on Robinhood. Throughout the decline, they were still piling into the stock, weekly data compiled by Business Insider show. By the time it was back down to pennies in August, more than 73,000 investors owned the stock on the app. Finally, Robinhood put an end to the madness on Monday, and barred new purchases of HMNY. Holders could still sell their shares, but no new investments could be made into the stock. It’s not clear when exactly those tens of thousands of investors bought the stock, but without any significant upticks in its price throughout the decline, there’s a slim chance for them to have made a profit. Robinhood isn’t the only place where investors lost money. Business Insider’s Nathan McAlone spoke to one retiree who lost more than $US100,000 betting on HMNY when analyst rating in e-trade recommended a buy. E-trade has not discontinued the stock. Asked for comment, Robinhood pointed Business Insider to an email it sent to customers about the barring of new purchases. “In order to protect our customers from the risks associated with some low-priced stocks, we remove the buy option for stocks like HMNY that consistently trade under $US0.10,” the email read. 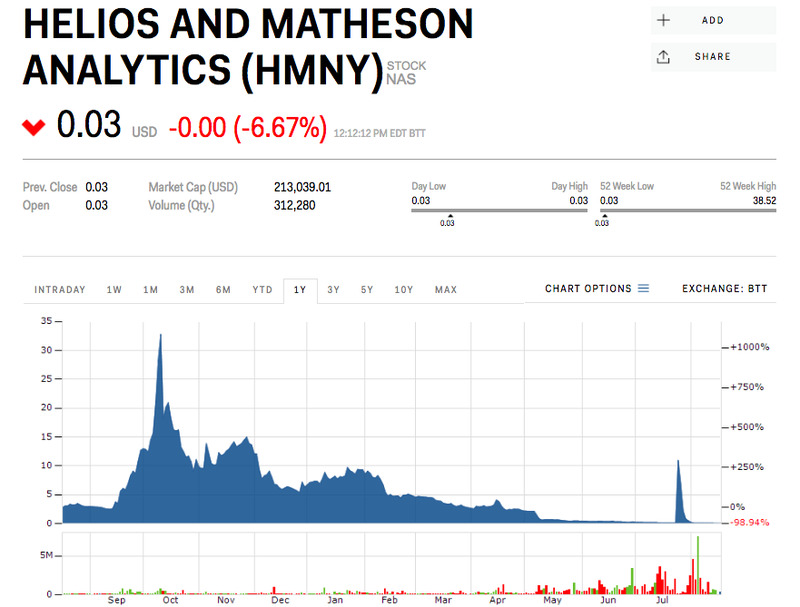 Shares of Helios & Matheson are now down almost 100% from their all-time high in October, shortly after the firm acquired MoviePass. Adjusted for the reverse-split, shares were worth $US8,225 at the peak. The stock is currently worth $US0.03.